Spain made world culinary news in 2006; when Ferran Adrià’s El Bulli of Roses, Spain was named best restaurant in the world by topping the annual S. Pellegrino World’s 50 Best Restaurants list. In 2013 the cheerful Roca brothers achieved the same accolade for their El Celler de Can Roca in Girona, Spain. El Bulli became known as the birthplace of molecular cooking. Over the years thousands of foodies have travelled to Spain to taste the sophisticated cuisine of both El Bulli (since closed) and El Celler de Can Roca. Less rarified but with a much longer and effective record of influencing cooks and restaurateurs around the globe is Spain’s simple but incredibly popular tapas tradition. Almost 20 years ago, in the early nineties, tapas bars began to flourish outside Spain and across North America. It takes a while for most trends to reach St. John’s – some never do – and others never take hold. Sometimes it depends on how the trend is introduced and who’s doing the introducing. A gentle nudge is better than being prodded by a steel ankus. 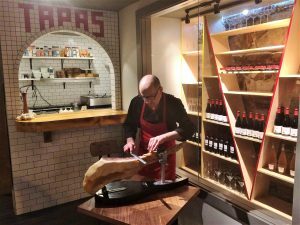 Boca Tapas Bar, the newest player in the St. John’s restaurant trade, is the first St. John’s business to fully and wholeheartedly embrace the tapas concept. Derek Locke, Lorne Loder and John “Bull” Cook share ownership of Boca Tapas Bar. Cook has decades of experience in the hospitality industry. Locke is no neophyte, since he opened the successful Piatto Pizzeria on Elizabeth Avenue almost two years ago. All three men have plenty of general business experience and acumen. Locke is a sturdy, 52-year-old of average height with an open, expressive, face – the opposite of a poker player’s. He leaned against our booth with an engaging smile and casual attitude. Wearing a short, dark, winter coat and everyday clothes, he told us he’s “starting to like” the restaurant business. So far, he’s having success, which to a degree accounts for his enthusiasm. He talked about Spain, its cuisine and culture. I got the impression he’s been there, possibly more than once. He spoke of the coastal regions, the inland areas, popular ingredients and a special chorizo he recently ordered for Boca. He also raved about Boca’s staff; and based on what we experienced there, they deserve to be raved about. 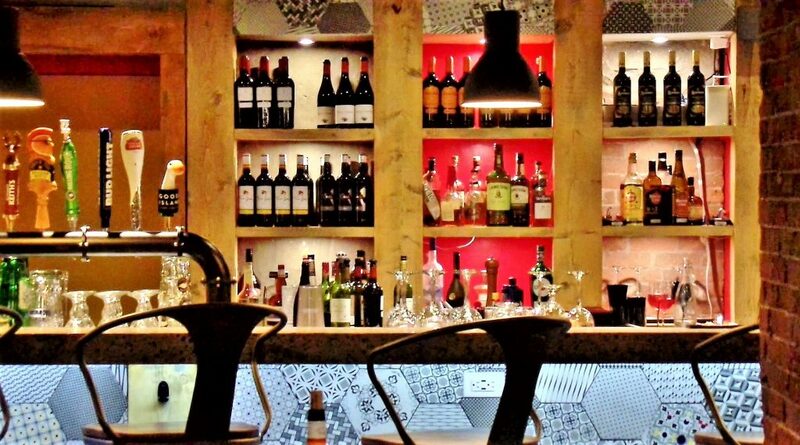 Boca’s booths are covered in panels of contrasting colours, although the geometric pattern is the same. Prior to the restaurant’s official opening, as a staff team building exercise, servers, cooks and managers got together to upholster the restaurant’s five booths. It allowed staff to get to know one another and created a bond, according to Derek Locke. Gregory Bersinski is chef-in-charge at Boca. He has more of a poker face than Derek Locke but breaks form when discussing food and wine, which, as friends confirm, are topics that “get him going,” animate him. He’s a continental European, a man with with soul. He loves history and art. Spain and its culture are of special interest to Gregory Bersinski. I mentioned the remarkably beautiful Sagrada Familia Cathedral in Barcelona to him, whereupon he identified its architect, Antoni Gaudi, and told me about his collection of books on Gaudi, his art and architecture. Bersinski knows the quality of things, be it a Charvet necktie, a bespoke suit, or a white truffle. 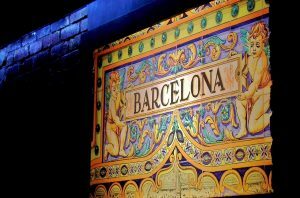 Bersinski, the owners and team are committed to providing an experience at Boca Tapas Bar that is as close as possible to what’s available in Spain. Thanks to the Canada-European Union Comprehensive Economic and Trade Agreement, Boca Tapas Bar can import ingredients directly from Spain. Ingredients such as the famous Spanish ham, jamón Ibérico – also known as pata negra – from black Iberian pigs. Boca also offers a range of gourmet seafood products from Spanish producer, Conservas Cambados, located on the northeast coast of Spain near Pontevedra. In Spain it’s wise to find a tapas bar where the locals hang out, places with few tourists, where the food is always excellent. El Zaguan is such a place. It offers an overwhelming variety of tapas and pintxos: sardines, anchovies, crab, shrimp, tuna, ham, soprasada, dried beef, pork sausages, cheese, and egg salad for the unadventurous. El Zaguan, in Ibiza Town, is first rate. (I know because I ate there.) Boca Tapas Bar, in St. John’s, is also first rate. Spanish food is flavourful. It helps if the atmosphere in which it’s consumed is also flavourful. Light and colour has been employed perfectly at Boca; and while it’s literally in a cellar, off Clift’s – Baird’s Cove, Boca Tapas Bar glows warmly. It invites and embraces. 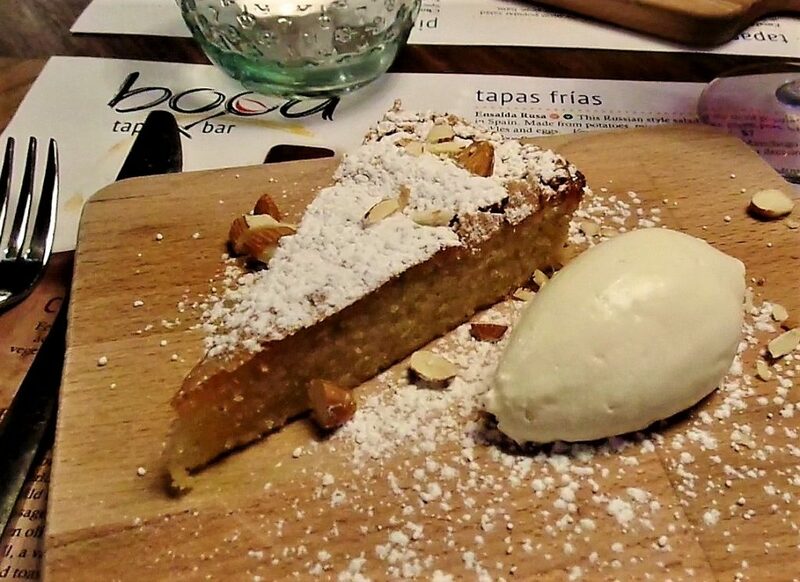 As you enter Boca, eyes are drawn to a picture of a nineteenth century Spanish girl, wearing a black dress with white lace collar, who’s holding a container of food in front of a sunshine coloured tiled wall – Spanish tile. Fronting the bar there’s what appears, from a distance, to be more Spanish tile, blue and gently lit from underneath the counter. Square and rectangular white subway tiles cover the wall to the right of the bar, a corner with an open, arched pass from the kitchen. 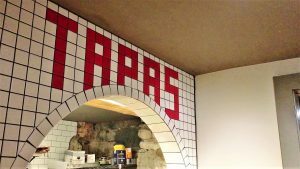 Above the arch, the word TAPAS (all caps) is written in bright, red tile. A floor to ceiling cabinet shares the corner. It’s filled with Spanish wines. On Friday nights, a Cuban entertainer, Onelvis “Hierrito” Fernandez, sits next to the wall of wine and performs Spanish guitar music. Sometimes, people dance. Tapas tradition began in southern Spain’s Andalusia region. A tapa is a small dish of food. It could be a few meatballs or a piece of salt cod in tomato sauce. Tapas and pintxos – usually pieces of food on a slice of bread – were served with a glass of fino – light and dry Spanish sherry – or wine, originally, to keep the appetite in check until the day’s main meal. Boca has tapa size and full servings of several dishes. 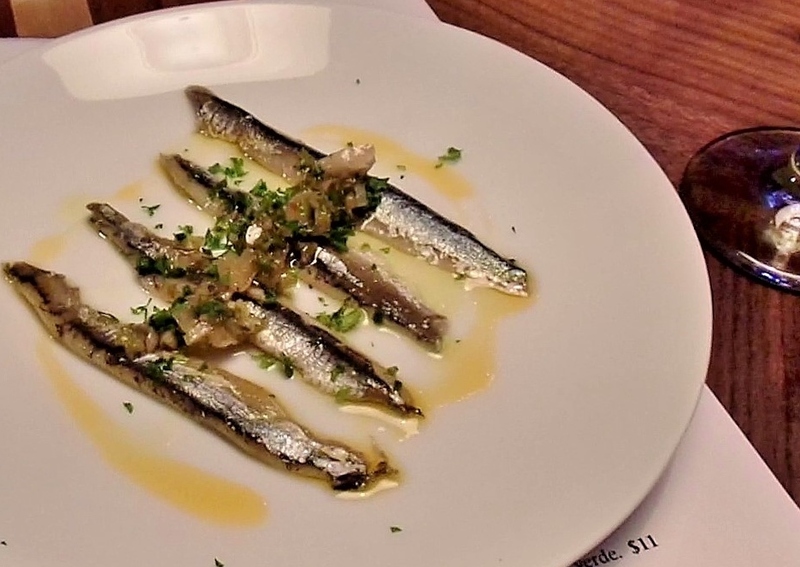 Boquerones are white anchovies marinated in olive oil and served at Boca with chopped red onion and herbs. Unlike the tinned anchovies they’re milder tasting and less fishy but have a similar texture. If you’ve never been keen on tinned anchovies try these. 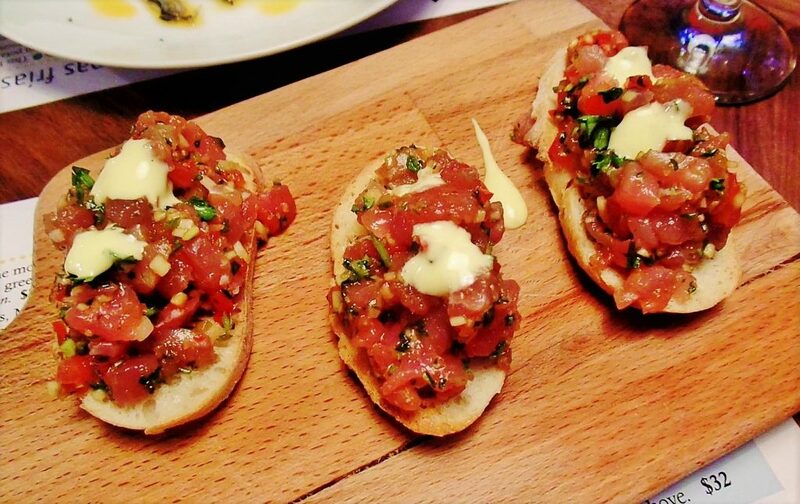 Also try the tartar de atun or tuna tartar with lime aioli on a piece of toasted baguette. It’s of superb quality. I happily washed down several pieces with Freixenet Carta Nevada Extra Dry Cava. 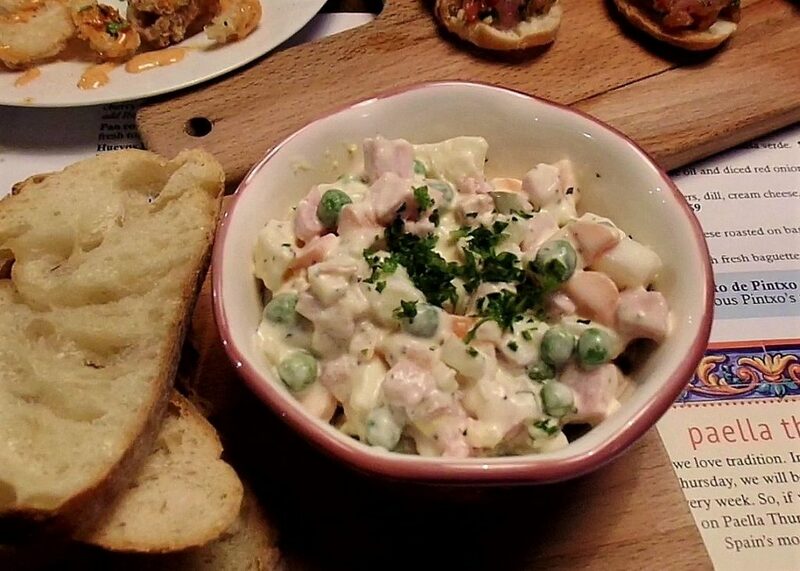 In Spain, a constant on many tapas menus is ensaladilla or little salad – sometimes called Russian salad. 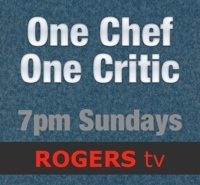 There’s nothing commendable about it, from even the most prosaic culinary viewpoint. It’s simply a mixture of tinned vegetables stirred together with mayonnaise. Yet, Spaniards – who, ironically, are reputed to prefer top quality food – love it. British based food writer, Fiona Dunlop, surmises that Spaniards must have an “atavistic yearning” for the concoction. Perhaps such atavistic yearnings were at play in Newfoundland. We adored green labeled, tinned Heinz Vegetable Salad, which also had a slight green tinge – no doubt from the green peas in it. Heinz’s salad also contained diced carrot and potato and tasted mostly of vinegar, sugar, and salt. I recall stacking tin after tin of Heinz Vegetable Salad on our grocery store’s shelves when I was a youngster. Boca’s Russian style salad is a fresh version of the traditional Spanish salad. It’s made from fresh potatoes and vegetables, along with ham, pickles and eggs. We enjoyed the homey, delicious cold salad with Toro Loco Tempranillo wine and thin shavings of pata negra, pata negra lomo (from the pig’s loin), bread, mild peppers and La Mancha’s famous sheep’s milk cheese, Manchego, with mild bite and creamy finish. The aged, dark coloured ham is highly flavourful, and leaves a slightly salty, rich, pleasant taste in the mouth. 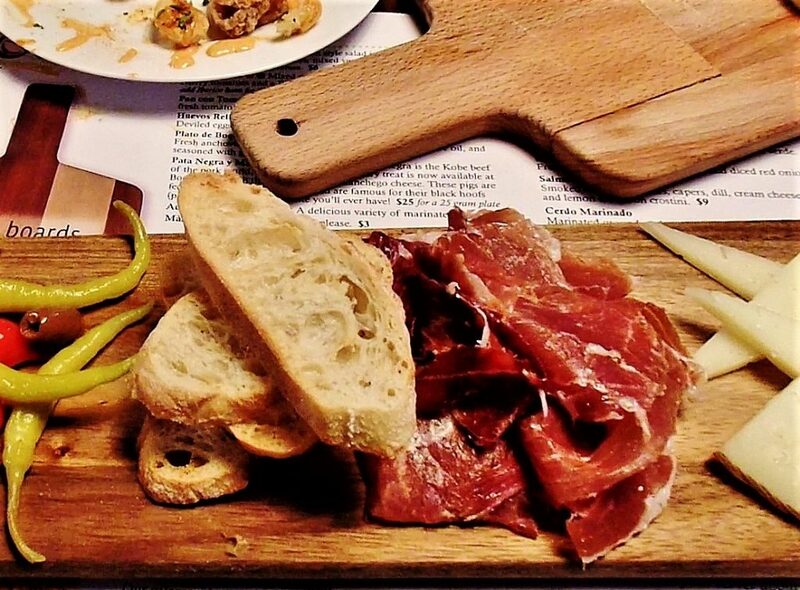 Pata negra lomo, an even better ham, is available on Boca’s suprema charcuterie board. Tapas, especially when drinking bold, young Spanish wine, should be equally vivid in flavours and seasoning. If it were possible to taste Spanish flamenco music, that’s what tapas should taste like. An impressive Basque seafood soup – ubiquitous Mediterranean fare – delivered such taste. 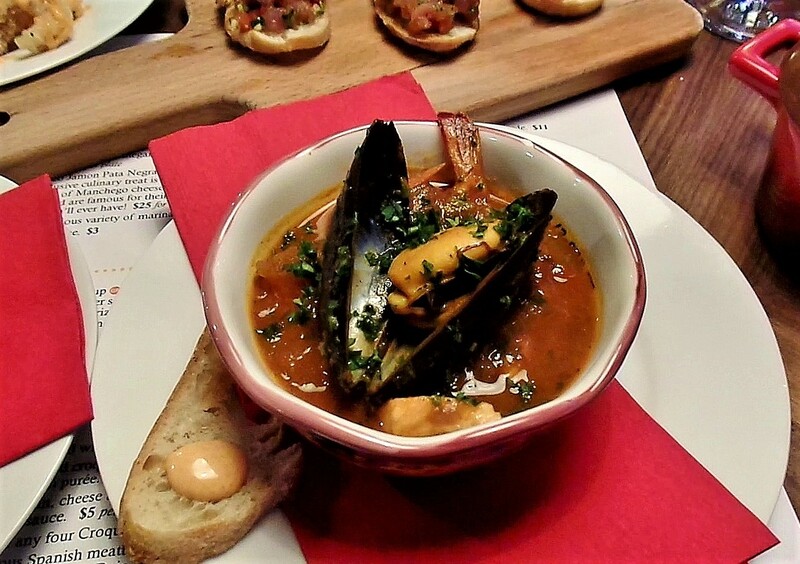 Topped with a plump mussel, the red tomato stew contained shrimp, fresh whitefish and herbs. Fried items included patatas bravas and calamares or squid. 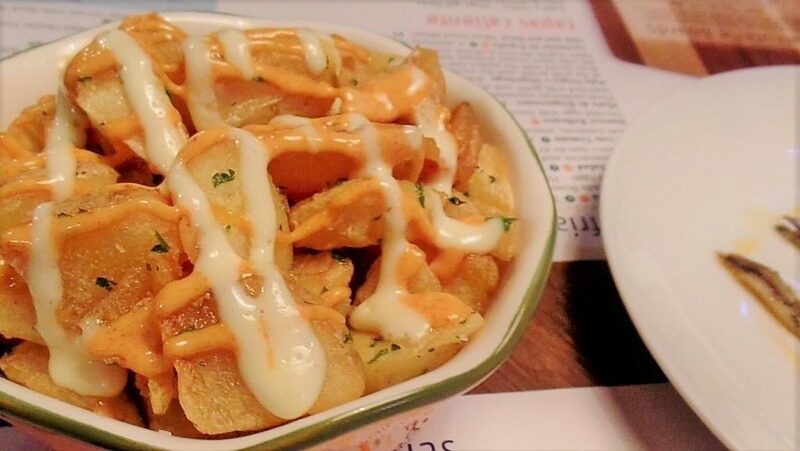 The chunky potato or patatas bravas came golden with a tinge of red, thanks to the application of smoked paprika and aioli dressing. With crisp exterior and tender, warm flesh, the patatas were fun to eat, especially with Boca’s equally crisp, sometimes crunchy, paprika dusted squid. Familiar flavours, for most St. John’s diners, that go down well with cold beer. 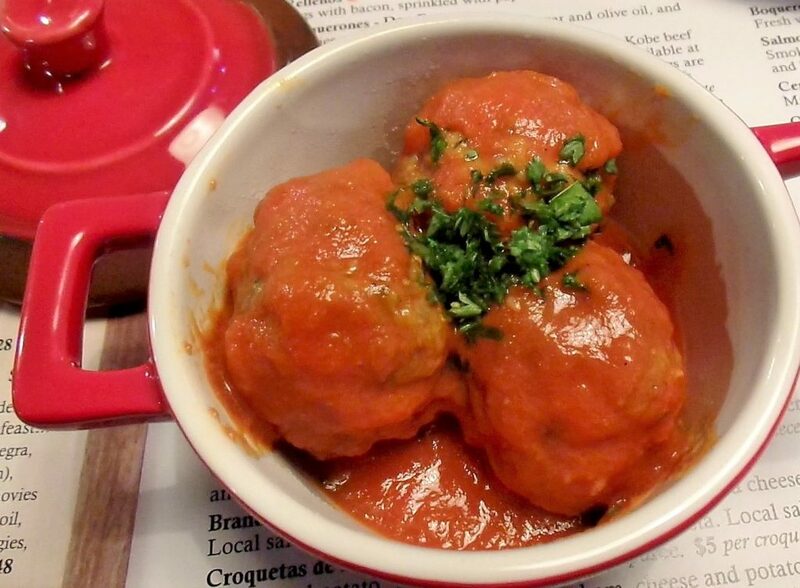 What’s better than ground beef mixed with jamón Ibérico, rolled into balls, then fried and steeped in tomato sauce? Not a lot. Boca’s Spanish meatballs were the best meatballs I’ve had in years, juicy and full of taste. Is it the quality of the beef, the addition of the jamón Ibérico, or the well-developed tomato sauce? All of the above I think. 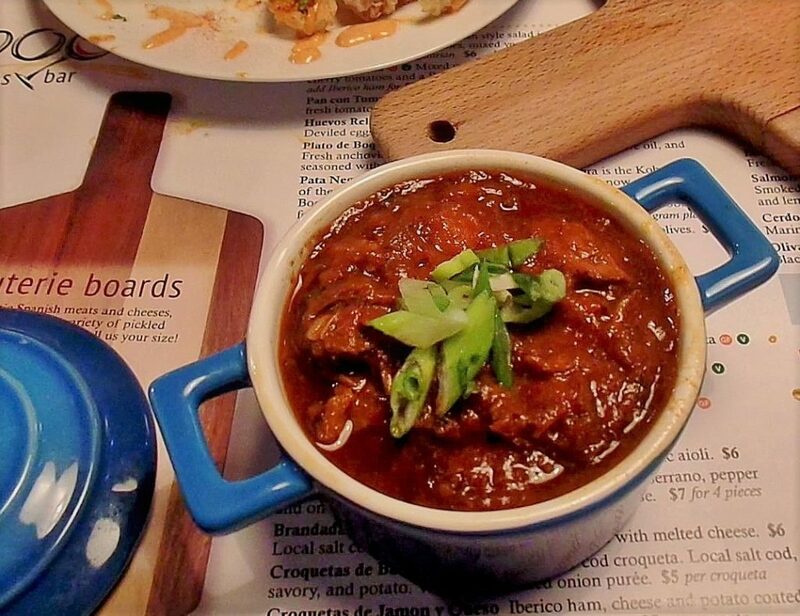 It’s not often that lamb stew appears on local menus, unless it’s for St. Patrick’s Day. Gregory Bersinki does a masterful job of braises and stews. His Madrid style lamb stew with boned lamb, red pepper, tomato, smoky paprika, garlic and splash of wine had punchy, deep flavour, helped along by the subtle gaminess of the lamb. One small bowl can provide enough energy to keep you going for hours. You’ll find St. James cake – James is the patron saint of Spain – or tarta de Santiago throughout Spain. Boca’s rendition is sublime. Chef Bersinski credits his sous chef, Javier Jaso. The dairy free tarta features ground almonds, eggs, cinnamon and a little sugar. Served with a side quenelle of fresh cream infused with amaretto, the moist cake, redolent of almonds, and only mildly sweet, went beautifully with a rich double espresso. 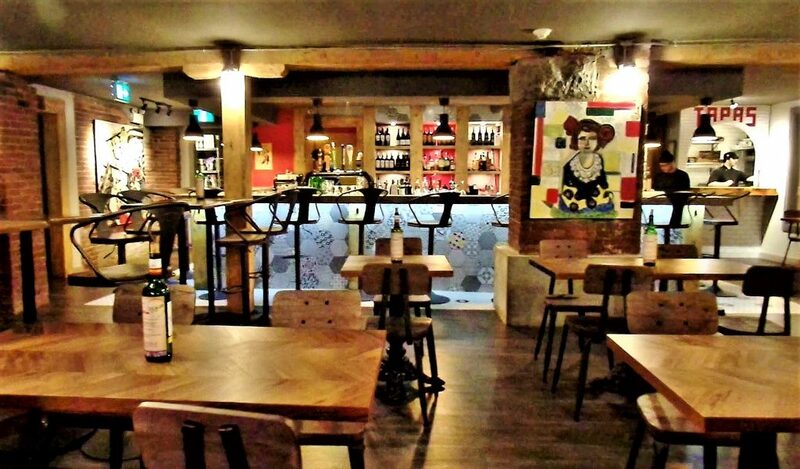 Boca Tapas Bar provided a thoroughly enjoyable dining out experience with lovingly prepared food and warm, friendly service. I was slightly disappointed that Boca’s black pudding with quail egg wasn’t available on a Wednesday, some of the usual Spanish tapas offal delights – sautéed liver, kidney, sweetbreads etc. – would be welcome menu additions, and Boca’s wine list needs expanding. No doubt some, perhaps all these points will be addressed in future. Meanwhile, I highly recommend you visit this new St. John’s bar restaurant. It’s a shining beacon in what’s been a gloomy period for local restaurants. Price Tapas for two with wine, tax and tip costs approximately $65. Service Servers at Boca are friendly and well briefed on the menu. Atmosphere Cheerful, relaxing and visually appealing. Open Monday and Tuesday: 5 p.m. to 1 a.m. Wednesday: 11:30 a.m. to 2 a.m. Thursday, Friday and Saturday: 11:30 a.m. to 3 a.m. Sunday: 4 p.m. to 3 a.m.
Credit cards Most major cards. Parking Street or nearby parking garage. Beverages According to Gregory Bersinski, “Ninety-five percent of Boca’s beverage list is Spanish, everything from sparkling wine (various cavas and Lafage Rose, 2016,) white and red wine, to a couple of finos.” He added, “We do a lot of sangria, white and red sangria and a couple of popular Spanish drinks as well.” Boca also carries the usual spirits and a modest selection of bottled beer. Draft brands include: Keith’s, Shock Top, Rolling Rock, Stella Artois and Goose Island. Gluten free options Yes. Please ask server for details. Vegetarian and vegan options Vegetarian yes. Please ask server for details.